After wearing a brace for a period of time, your teeth will have moved to the correct position and will be looking fabulous. After all the perseverance and money invested, the last thing you want is for the good work to be undone, which is a risk if your teeth are brace-free and left to their own devices! Wearing retainers for teeth is essential to preserve their alignment and is part of your treatment plan. Clear retainers are transparent, rigid plastic appliances made by taking impressions of your teeth, once your braces have come off. Clear retainers are easy to wear, since they’re versatile, discreet and clip on and off without any fuss. Typically, your orthodontist will recommend you wear clear retainers for a specified time every day, usually about 8 hours and usually at night. It’s very important to stick to the treatment plan and wear your clear retainers as directed. If you don’t, after a short time the retainers won’t fit, as your teeth will have moved slightly. If this happens, you need to go back to your orthodontist and take steps to rectify the problem, which will cost more. The life span of clear retainers is good, but at some point in the future you may need to renew them. A hygienic plastic box is provided to keep your retainers in. It’s important to keep them clean at all times. Fixed retainers consist of a little dental bonding applied behind the teeth that holds a wire to keep the tension so the teeth don’t move. At first you’ll be aware of the retainers in your mouth, but after a week or so you’ll forget they’re even there. Fixed retainers, as the name suggests, stay on indefinitely and are an excellent way to preserve the shape of your teeth. You can’t forget to put them in! The Hawley type of retainer’s the largest and most fully-structured retainer for your teeth that’s on the market. Although very effective, they’re more cumbersome compared to other retainers. 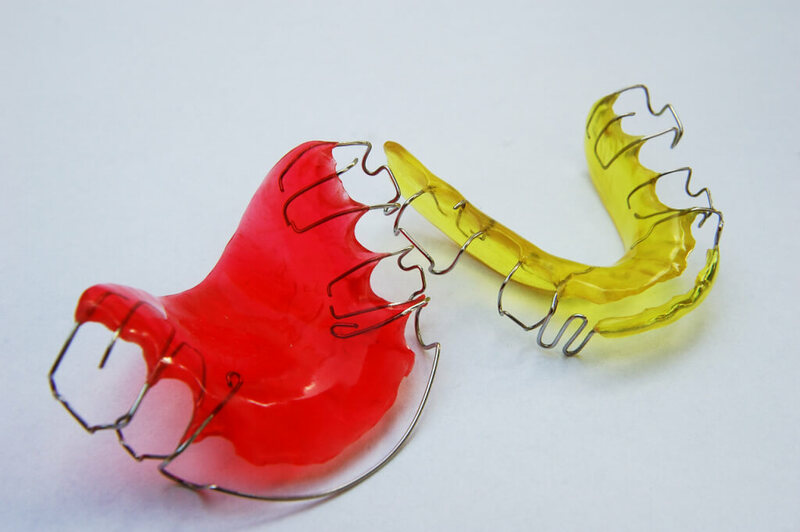 These are 2 separate upper and lower retainers with a thick plastic body, clasps and wires. The plastic part fits snugly onto the roof of the your mouth and the bottom retainer lies alongside your tongue. Both upper and lower retainers grip specific teeth with clasps, joined by a wire spanning the front of your teeth to keep them in position. Your orthodontist will advise on how many hours a day you need to wear these retainers. As with all types of dental retainer, hygiene is important and you’ll be given a special box to keep them in.